Okay, I don’t even have a clue why they need so many ingredients. Especially weird ones like invertase? What the heck is that?? I am proud to say my Homemade Junior Mints only contain simple ingredients! 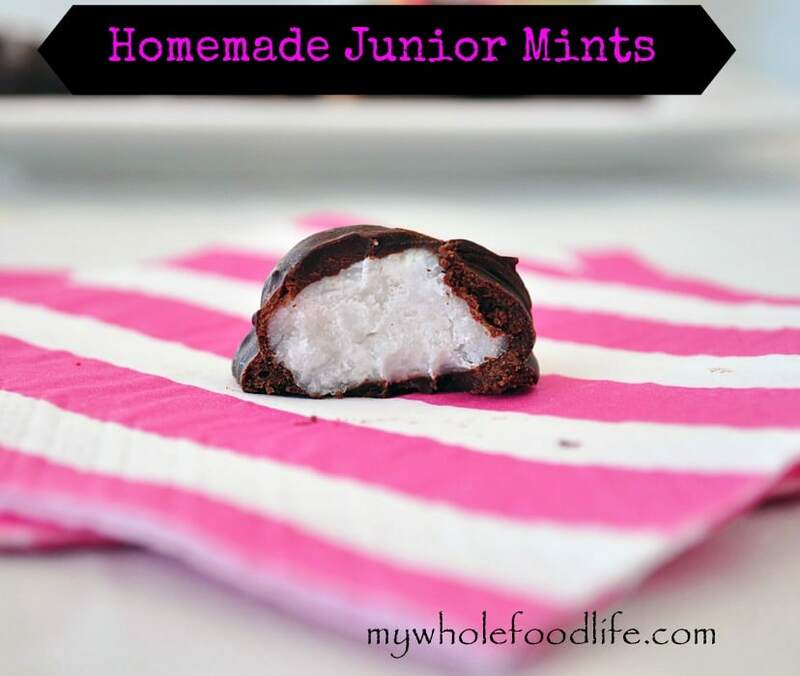 I am happy to say that these homemade junior mints are vegan, gluten free and paleo approved. If you are not a coconut fan, don’t worry. You seriously can’t taste the coconut flavor in this recipe. All I taste is the chocolate and the peppermint. The coconut butter in this recipe gives these homemade junior mints the perfect texture. If you like homemade candy recipes you should also check out these clean eating peanut butter cups and my coconut almond fudge. A cleaner version of the store bought classic. In a food processor , combine the coconut butter and peppermint. Scoop out little balls and set them on a parchment lined plate. I used a melon baller to form the balls. Stick the balls in the freezer. Once the balls are frozen, prepare the chocolate. Using a double boiler, melt the chocolate and milk. Once melted, take each frozen ball and cover it in chocolate. I used two forks for this. You need to work quickly so the warm chocolate doesn't melt the coconut balls. Once all the balls are covered in chocolate, stick them in the fridge to firm up. If you want to add a sweetener to this, you can add 1-2 tsp of maple syrup or honey. Add the sweetener when you are mixing the coconut butter and peppermint. These homemade junior mints should be stored in the fridge or freezer. They should last for a couple weeks in the fridge and even longer in the freezer.